In celebration of Wheaton College’s 150th anniversary, a Sesquicentennial Gala is being hosted on campus. *The tradition of the Washington Banquet dates back to 1909, on the centennial of Lincoln’s birthday. From then on, it was held on Washington’s birthday, as was originally intended. Dr. Benjamin VanRiper, head of the chemistry department at that time, suggested the banquet. The impetus behind the idea was to have one time each year when faculty and students would get together as a family for an evening of fellowship and festivity. The programs of the early banquets included class speeches, yells, songs, toasts, and dinner. 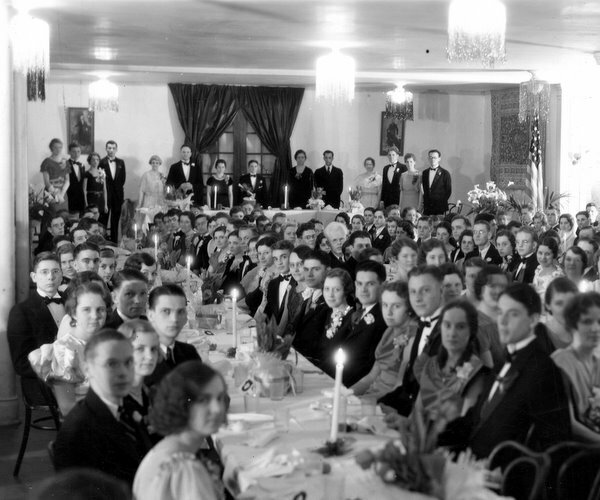 The February 23, 1927, issue of The Wheaton Record reports that the “banquet is a time for exhibiting a maximum amount of class spirit.” The highlight of the banquet was to see which class could decorate the gaudiest and yell the loudest. So serious was the competition between classes, and so prime was the time for pranks that often the class orator would mysteriously disappear before the banquet. The identity of the orators had to be kept secret, lest they be kidnapped by members of another class. The Washington Banquet of 1912 has gone down in history as one of the more memorable. Professor Homer Helmick of the chemistry department oversaw the decorating committee that year. He turned the College into a brightly-colored city of lights, collecting and decorating with all the Christmas tree lights in the neighborhood and on Woolworth’s shelves. In 1938, the character of the Washington Banquet changed, taking on a more dignified air. Class talks were eliminated, there was less class rivalry, and dress became more formal. 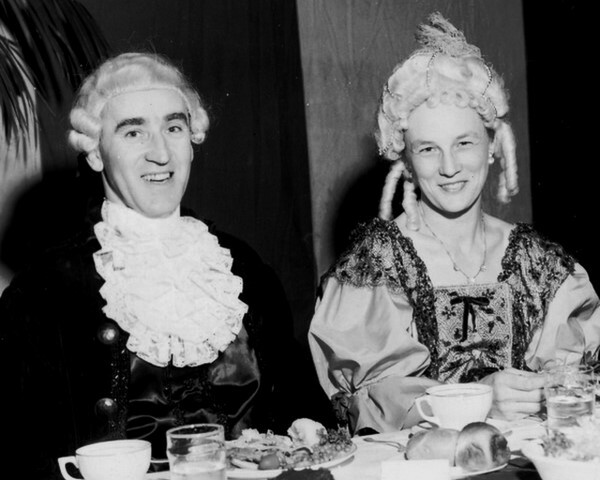 It was that year that the tradition of having a faculty member and his spouse dress up as George and Martha Washington was started.